Chapter 25 will again erect the stunning Memorial Mile in Olbrich Park, Madison, along Atwood Avenue. 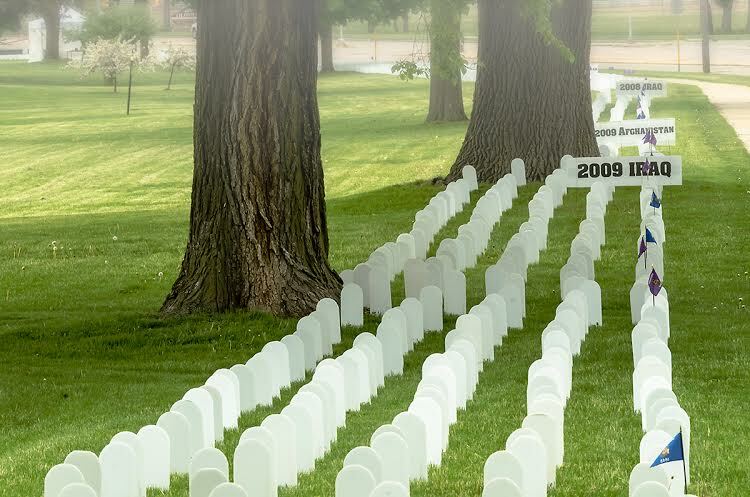 This impressive and disturbing mile of over 6,000 tomb stones is in memory to the US soldiers whose lives were lost in Iraq and Afghanistan. Since the first mile was erected in 2007, the chapter has received constant positive feedback from those who observe the mile by walking the sidewalk or even while driving by. The mile is erected by volunteers led by Chapter members. Starting at 9am Saturday, May 24, 2014, the mile will take about two hours to install. It will remain in place until Saturday, May 31 when volunteers will remove the display. This entry was posted in Clarence Kailin Chapter 25, Events, Memorial Mile on May 21, 2014 by Website Administrator.